Blu Energy Drink comes in an aptly colored can and cried out to be reviewed from its corner of the sleazy gas station named Speedo. Drawn to its strange label and claim to increase concentration, performance, and endurance I quickly purchased both petro product and already chilled beverage. I commence the short trek to my next destination and decide to look over the can’s label as I drive to see what Blue Energy Drink is all about. The usual ingredients are found and include: sugar, B vitamins, caramel color, natural and artificial flavors. All of the ingredients are fairly common except for one, carbon dioxide. I immediately wonder why the producers of this beverage included something that the human body expels on a regular basis. All I can come up with is that it is some type of preservative. Either way it makes me a little nervous. A website is listed also but I don’t think I’ll be going there. So I crack open the can of Blu and take swig. A fairly stock energy drink citrus flavor taste greets my taste buds. To be honest Blue tastes vaguely similar to other energy drinks but I really can’t remember which ones. I am not impressed by any stretch of the imagination, but I don’t find the taste of Blu bad or offensive. It has a light overall feel combined with a strong element of carbonation. I take a few more swigs and am greeted with more of the same. I finish the can and do feel some more energy, maybe Blu’s claims where true after all. Final Review: Buy a bottle! 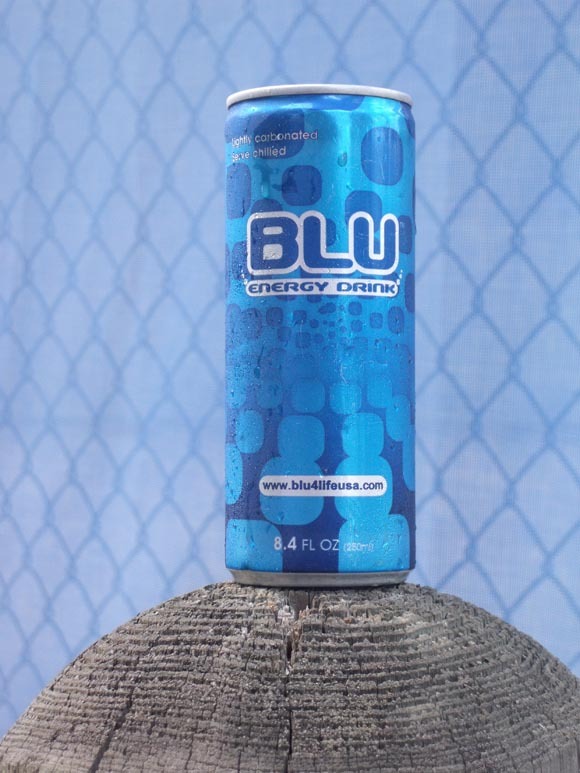 Blu Energy Drink can be considered a decent entry level energy drink for those looking for something to give a boost.